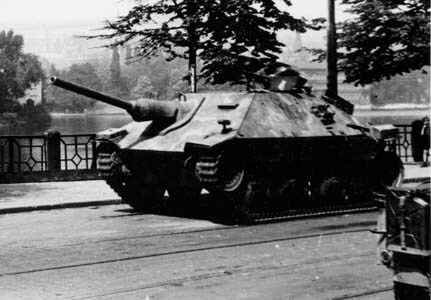 James Blackwell asked me via e-mail whether does exist some pictures of Hetzer Starr in combat action. They does exist. 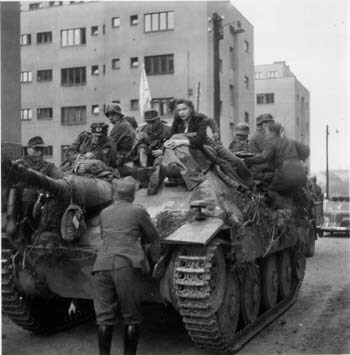 Hetzers Starrs were used in May 1945 by both encircled Prague German garrison and Kampfgruppe Milowitz. Kampfgruppe Milowitz was one of five Kgrs. which unsuccessfull attempted to open Prague for retreat of HGr. Mitte. It fouhgt against Czech uprisers/patriots/home army soldiers (whatever you want) in Prague from 5th till 8th May. After the cease of hostility it retreated to american lines in western Bohemia in the night from 8th to 9th May 1945. It was probably involved in one of the last armed action against soviet forces in the night from 11th to 12th May 1945 in Milin, near the town Pribram, south of Prague, too. 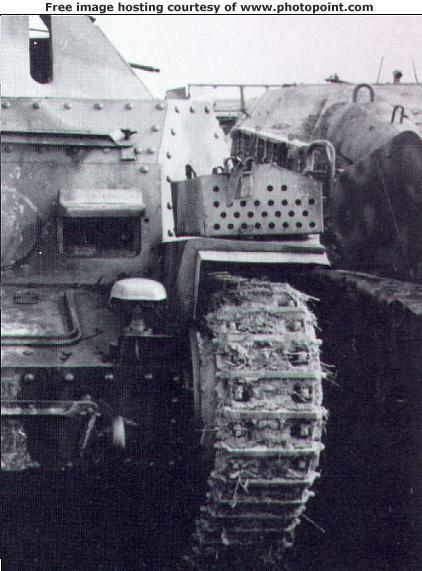 In the night from 8th to 9th May 1945 some Hetzers Starrs were used as transport vehicles by soldiers of Prague garrison too. 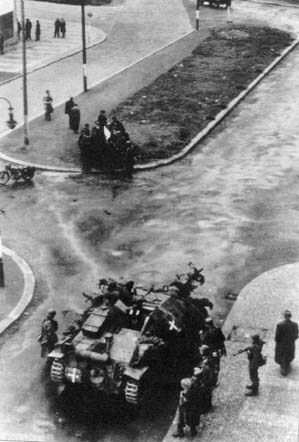 This picture was taken at 5 May 1945 in Prague - Dejvice, in times of negotiations between German garrison around Vitezne namesti and Czech uprisers in Podbaba. The main distinguish detail that this Hetzer is a Starr variant are two "inverted U shape" hooks on the top of gun shield and gun. Note: white crosses are on jerrycans. Next picture was taken in the evening of 8th May 1945, just before Prague German garrison came to its way to American surrender in Pilsen. The narrow gun shield is clearly visible. The last photo is from post-war czech use of an captured Starr. "Inverted U shape" hooks on gun mount and gun shield are clearly visible. Three digit number on it´s side is probably black 143. Camouflage is hard edged BMM three clor stripe scheme, the same as on all known Starrs.